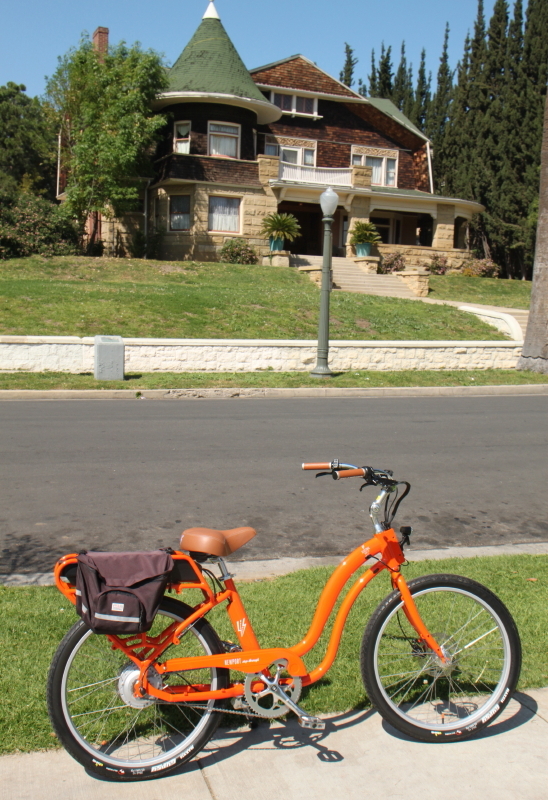 Electric Bike Company Model “S” E-bike—Tech, Power and Comfort. Sleek, stylist and comfortable, the Model “S” is quite a good rider. You might like all the cool innovations on this brand new E-bike out of the Electric Bike Company camp. Some major brainstorming has been going on behind closed doors—and the result is this new line of bikes, both step-though and classic. In addition to being a quality built, powerful and comfortable E-bike, it has features even you probably didn’t think we needed—-yet we do. I will try to list them all while I give you my impressions on this orange speedster (they do come in other colors). A very informative display is part of the package. First off, because they will be offering an extension cargo bike front with a large carry basket and also a custom made trailer (the trailer hitch is integrated to the rear rack), this E-bike has been adorned with more (much more) power than your average E-bike. 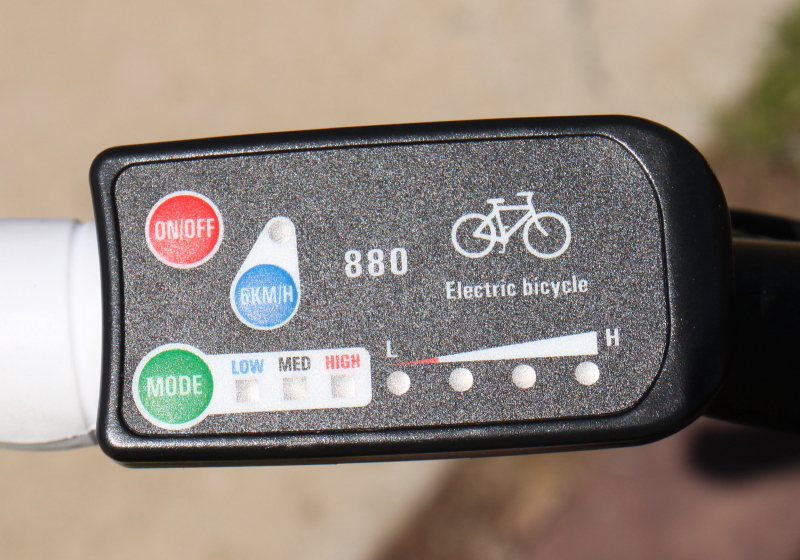 The bike comes preset (with the display modes) with normal speed and power levels. Although the main reason you might change it is to lower power available when the bike is lent to friends, you can increase it too. 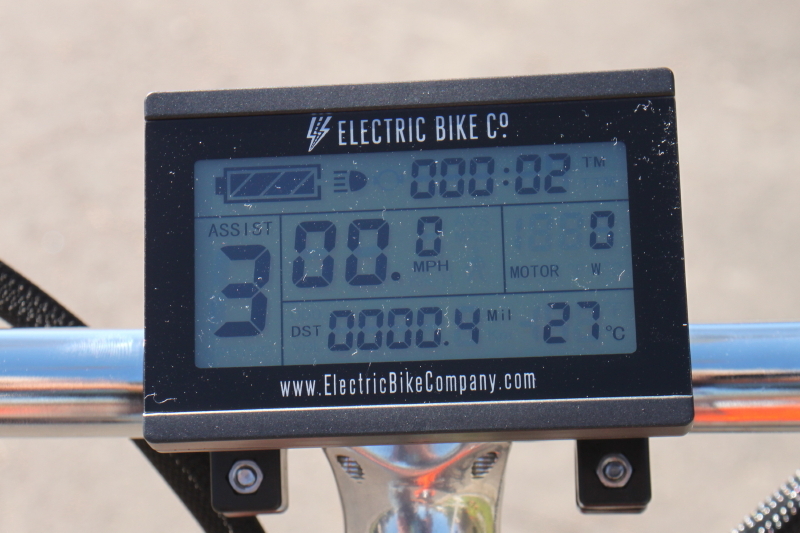 I set it to max speed and power setting to find it becomes the rocket ship of E-bikes. Going up my local test grade at 20 mph was a one time event. I reset it before too long, where it should stay, unless you really need that extra power (when hauling a heavy load with the cargo extension or the trailer). We took it to the LA Tweed Ride. Although not vintage, it got its share of attention. The control panel is actually two pieces. One is the close at hand pushbuttons. The three buttons easily control every function of the bike, most importantly the ones you use while riding. That is nice so you don’t have to take your hand from the bar, and once used to the bike, eyes from the road either. The display is filled with good info, and even tells you when the onboard head and tail light are lit. Of course when they are on, the display is backlit too. The lights are strong, easily good for basic riding. I personally add an auxiliary front and rear light when hitting the open road. 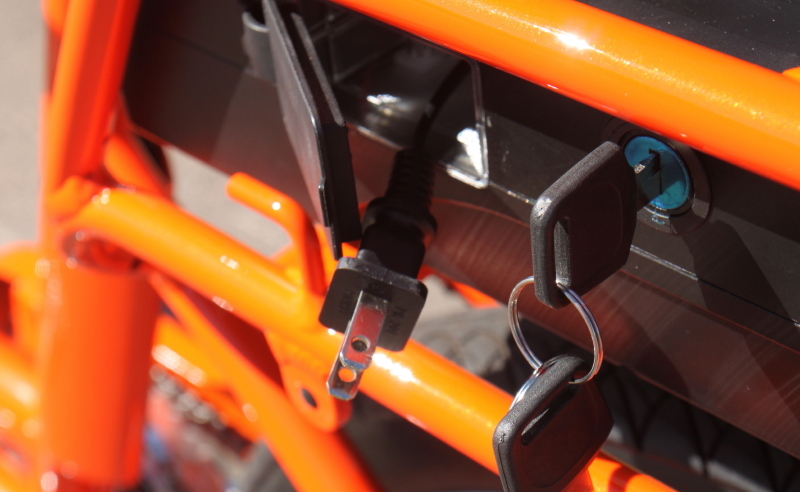 They even spec a cable lock clipped to the rear rack so security is close at hand. 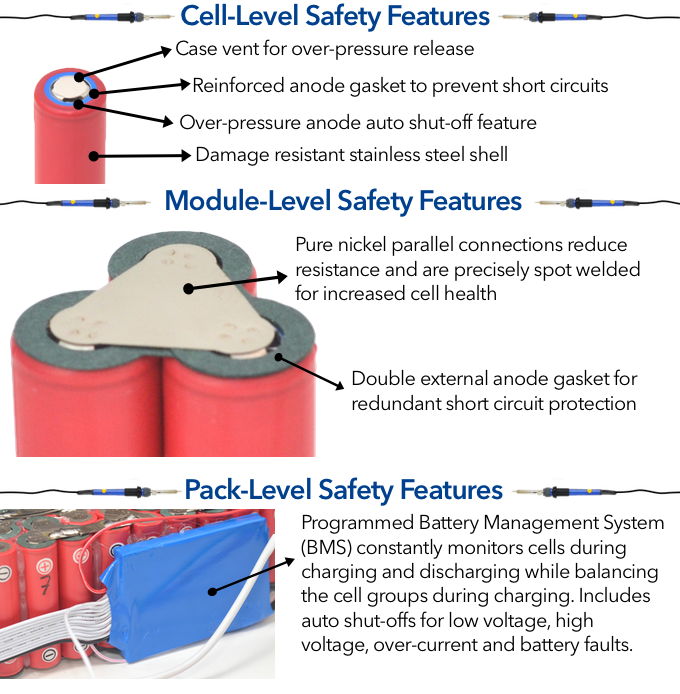 More innovations surround the battery package. 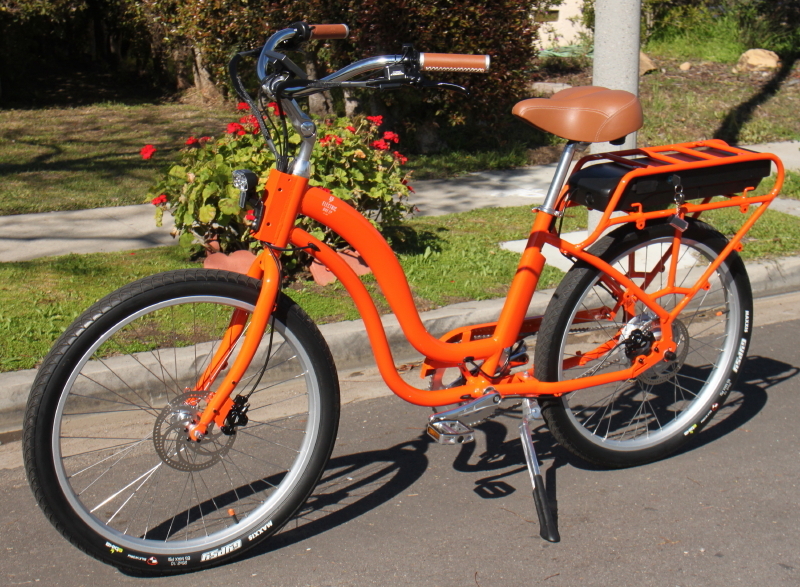 The Model “S” is a 48 volt E-bike. You do have options on the battery capacity—from 10 Ah to over 17. The battery charger is onboard and requires only a pull on the spring reeled cord to insert it into a 110 outlet. At that point the green and red LED lights there will signal your charge completion. 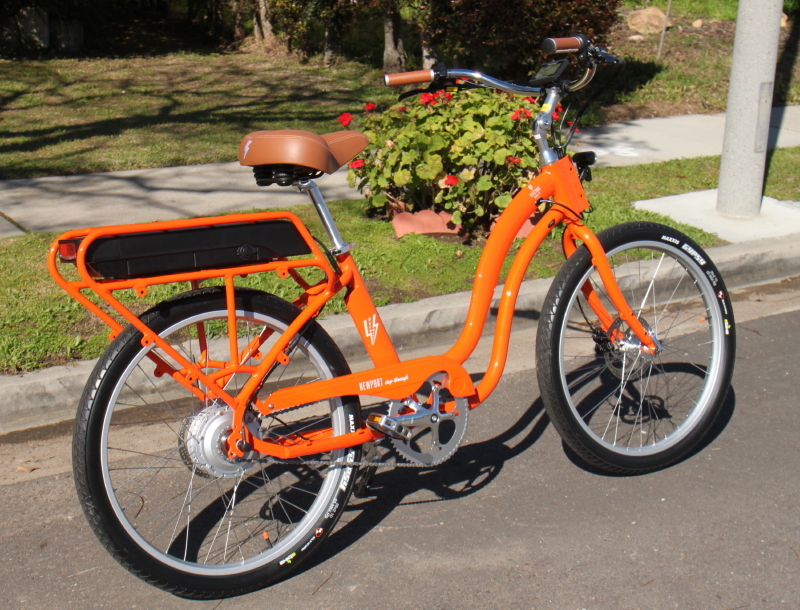 They offer two front baskets, one with an auxiliary battery to lift your ride range to close to 100 miles between charges. It is a plug and play set-up with a switch to power from one battery to another. Here is the plug for the built-in charger. The cord reels out and the red/green lights are just inside the housing. The bike has a USB outlet on the display. The battery has a 12 volt cigarette lighter type outlet for many uses. One is the little transformer they give you to make a second USB power port. 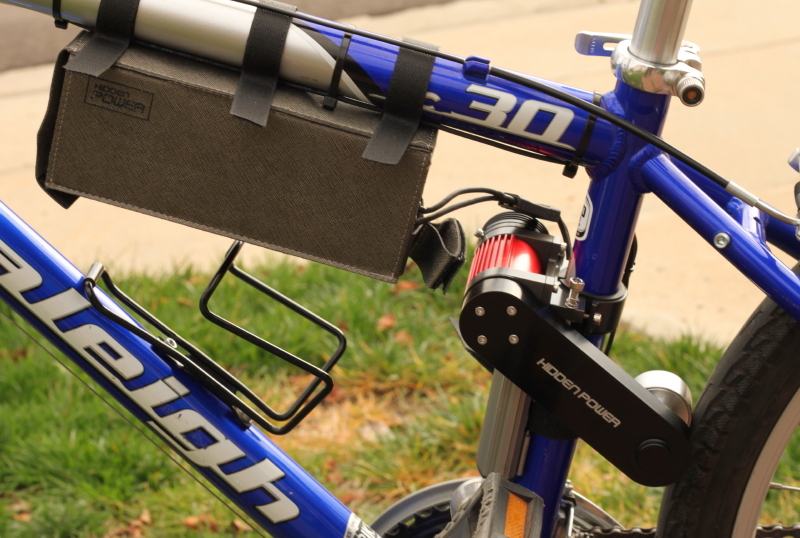 Another fun use is the optional powered food and drink cooler (an option they offer) that will ride on the rear rack. The bike is covered in so many places with threaded spots for front and rear racks (options they offer)—side surfboard racks (an option they offer)—front panniers—fenders and who knows what else you will want. Another option on its way is a very small and light battery that mounts where the front basket normally sits. Some might like this to balance the bike some and reduce the weight if they only plan on shorter rides. During all the rides I found the stock balance to be nice, a tad heavy in the rear, yet you would only notice it if you are doing BMX jumps. Cool thing is those jumps would probably be fun and not hurt the bike. It is built with HD components and the rear frame uses 3mm thick wall tubing, twice the strength than most any bike you will ride. The good looks hide the extreme power this bike has. The bike is a blast to ride. 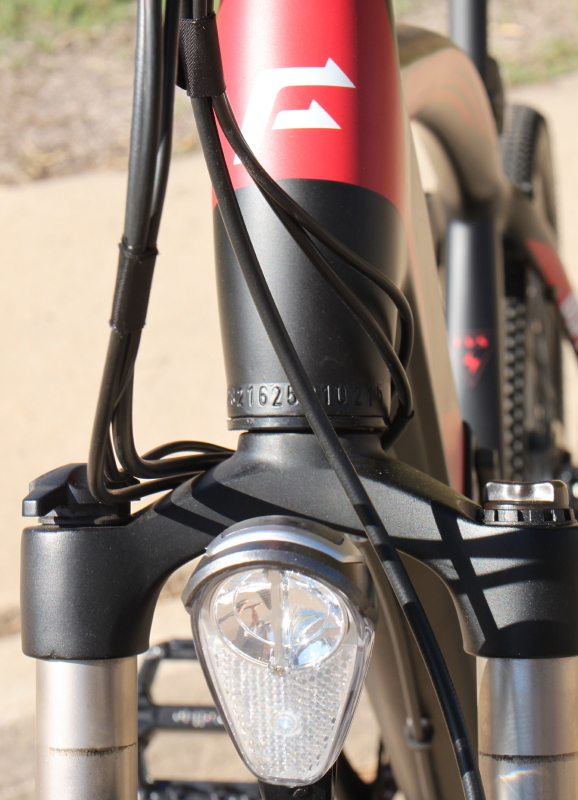 The adjustability in the bars, stem and saddle should allow most any size rider a good fit. They have a great saddle design ands it matched me well. Keep in mind on the really long rides a wider saddle like this isn’t as good as one a bit narrower. Their decked bike comes with a suspension seatpost, which I am sure you can get for this version. I was a little surprised that when they dropped off the bike for me, I ended up with the “stripped—basic” version, while in the van was the fully equipped model (minus the awesome option mag wheels). Not a problem as I was able to video of it so you can see the extra pieces, and took it for a short ride. A strong motor, single speed and big brakes are on this end. Now as you take to the road you might notice this is a single speed bike. On the whole I liked the simplicity there and no shifting makes for a less complicated ride. 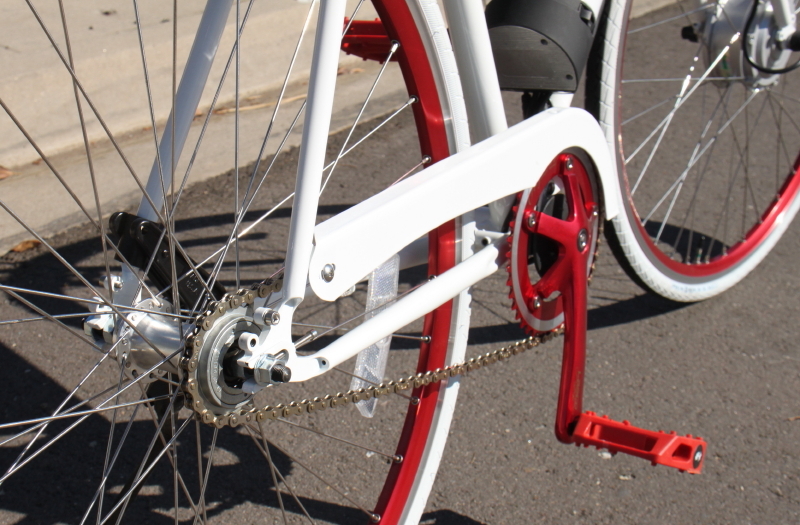 They do offer different rear gears depending on you and your ride locales. Because the bike has dual control (5 PAS (automatic pedal assist) power levels and a thumb throttle), getting started from a stop and the need of being in a specific gear is way down on the needs list. 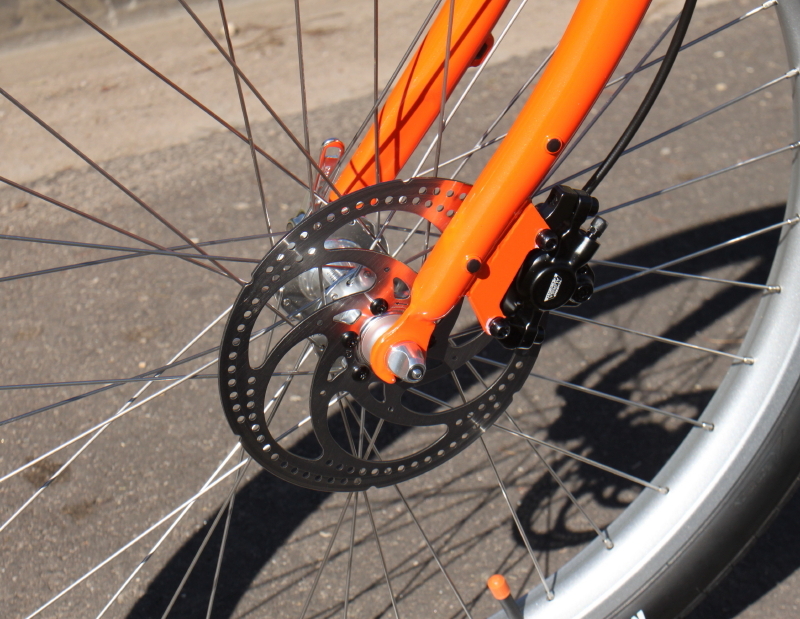 If you are a stickler for gears or have very steep grades in your near future, a basic 7 speed derailleur gearing system can be easily installed. The tire selection is right up my alley. The give a great ride compared to those skinny little tires on some of the E-bikes you will see. What you find too are some beefy rims and oversized stainless steel spokes. In fact everything on the bike that isn’t painted aluminum, plastic or chrome, is stainless steel. This bike is designed to last long and give great service for years. And you can tell much of this just by riding it, it is solid and smooth, two things everyone strives for in their new or old bike. Every E-bike needs good brakes. I found these hydraulic brakes to work great without being too strong or sensitive. I guess you can tell I enjoyed my time with the Electric Bike Company’s Model “S”. It not only looks good to make you feel wonderful, yet also gets people’s attention as you ride and stop to shop or relax at a great destination. Not once did I get a bad feedback from the bike. It was like a best friend doing all I wanted and being right there when I needed it. I first met the crew almost 2 years ago as they were getting the first version out there for the potential customers. They have worked long and hard to get such a cool E-bike that is so unlike many others. I think they have done a wonderful job, but I bet they aren’t finished yet. This bike finally came onto the market the beginning of this year (2017). A few of the neat options are still getting their final detail worked out, but expect them very soon. From what I have seen and experienced, it would be hard to go wrong calling the Electric Bike Company your E-bike maker. Hit the road with confidence, Turbo Bob. You can find these bikes at their website. This sweet bike is great to ride. Motor control systems on electric bikes are a big concern of mine. Having one that is not jumpy or unsafe is key. Having one that custom fits the riders needs is perfect. I maybe coined the term dual control for E-bikes that not only have automatic motor control (PAS), yet also have a throttle so pedaling isn’t always necessary for the assist. Normally the PAS is cadence driven (sensing just the fact the pedals are turning) or torque sensed (smart control that can sense your push power on the pedals and give the assist to match your leg power correctly). What a great display unit—It does so much for you. The Smart Motion bike goes to a tri-control with a great new innovation. The three ways to control the motor power are far from all the cool features on this new E-bike from Lectric Cycles, yet it is worth getting excited about. What adds the 3rd control factor is it has the throttle that the majority of E-bike rider need (and fewer and fewer E-bikes have them), (bad move from the manufacturers I would say). Yet is also lets you switch your PAS between cadence and torque modes. This gives you great flexibility in ways I haven’t experienced on any other E-bike. I think I documented the way the control system works and blends with your ride fairly well on the videos I did (and you can see at the bottom of this post). I have to say I like the variety, the ease of use and the general feel of the Pacer’s control system. It is important on E-bikes to feel comfortable at all times. 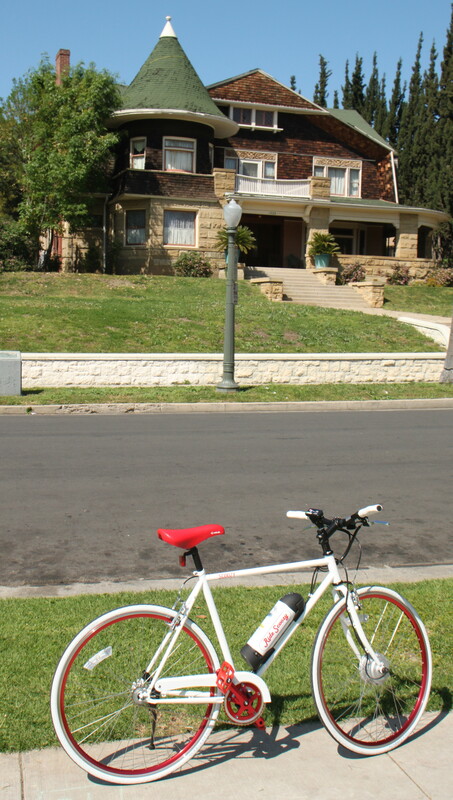 The bike itself also made for a comfortable feel, so easy riding is the result. It is a big bike though, (not so much for me at 6” 2”) with the large frame they supplied me and the 27.5 inch, not too aggressive Kenda tires. Not to worry there, as Lectric Cycles offers this bike in a smaller frame size. They also have 6 bike styles including a hot dog mountain bike and several urban bikes, some with low frames, like I would normally ride when possible (comfort step-through frames are just right for the aging E-bike crowd). The even have a SmartMotion folding E-bike called the Vista. When you add the convenience of a folding bike with an electric-assist you really are making the best bike for the masses of people who want to ride easy, use intermodal transportation and have the ultimate in bike security. This Pacer comes so well equipped. The motor battery fed front and rear LED lighting are exceptional for a bike in this price range. I always add additional front and rear lights for the bigger rides, yet these will really do for most any run on the local roads. There are also extra frame LED lights for coolness and visibility. The solid and fancy rear rack is a blessing. Chain guard, strong kick stand and lightweight fenders are things I need and don’t want to spend the time and money finding, so having them included is great. The ergo grips and bar ends feel good, although the thumb throttle placement need some work. On even some shorter rides, the fatigue came quick. Lots of battery power for those long rides. The massive battery (power, not necessarily the physical size), is semi-integrated into the frame. 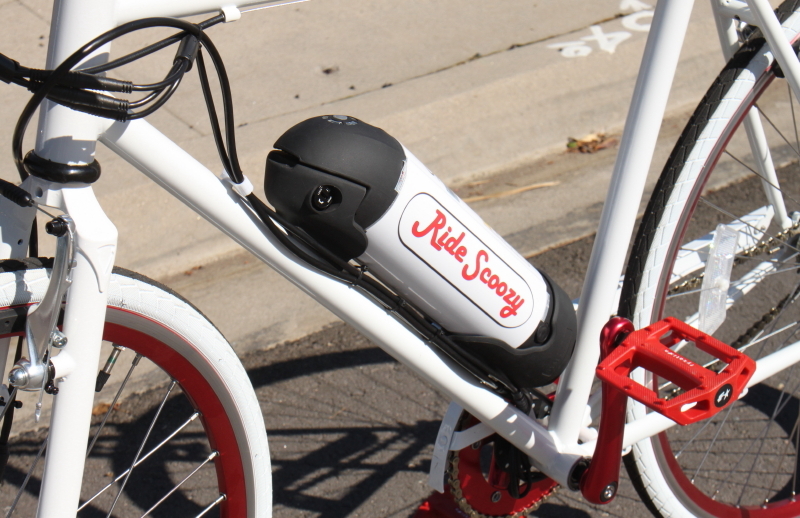 It has a USB power output port and easy removal of the battery from the bike if needed. The range and power available is so much better than most E-bikes out there. One thing you might find interesting is that with just throttle use, the bike’s motor assist is limited to the Class 1 and 2 speed range of 20 mph. 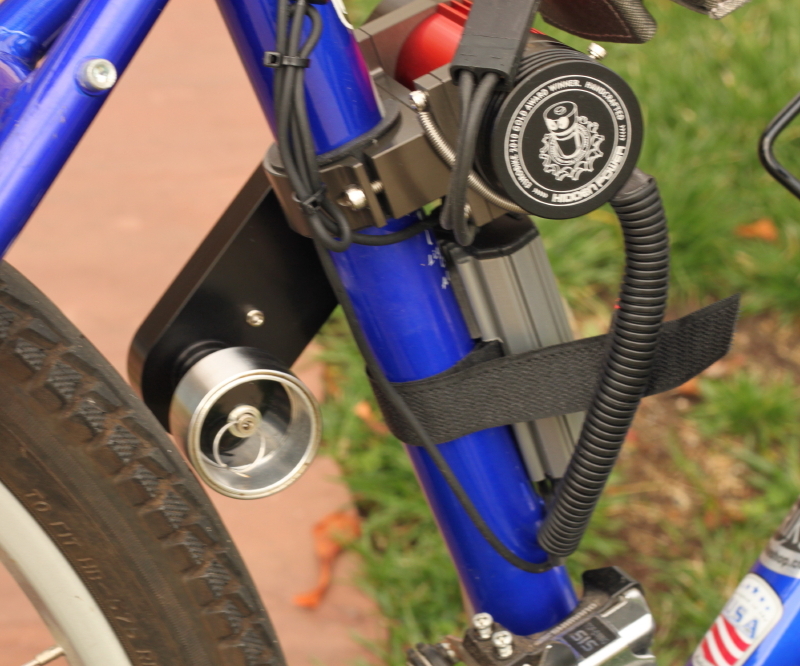 But in the PAS modes, if you have the pedal power yourself, the motor will assist you to the class 3 range of 28 mph. If you are using that extra power, make sure to get your SmartMotion Pacer with the largest capacity battery. 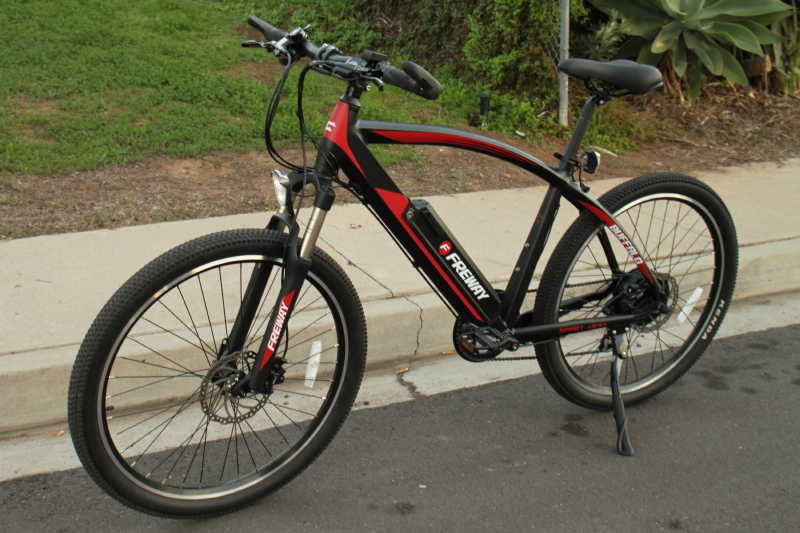 The bike comes with 3 battery options, my recommendation with any E-bike, is the get the most powerful option they offer, in this case it is 17.5 Ah (48 volts btw). Ready to ride, ride hard and ride fast. 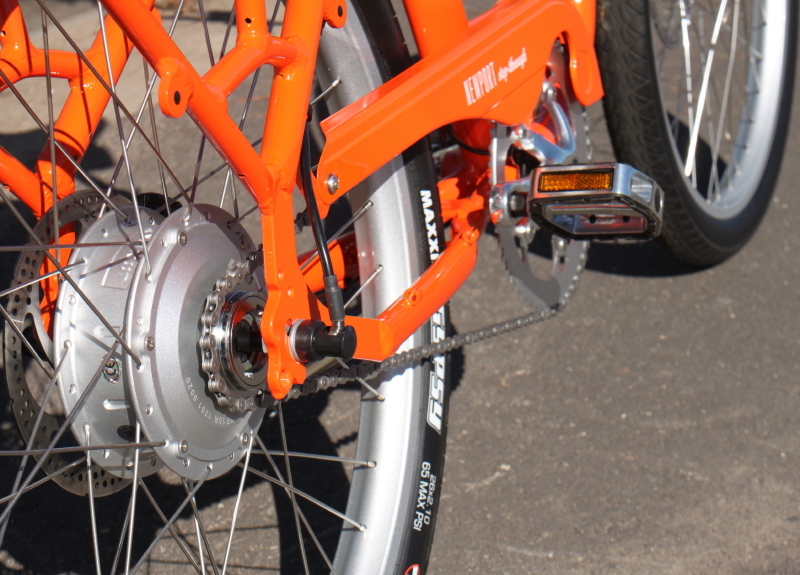 Big strong hydraulic disc brakes are being seen on so many E-bikes nowadays (this E-bike has them). I can’t say I am a fan of them. They can be so powerful that a rider can take a dive in an emergency when the brakes are applied too quick and strong (even with much practice this is too easy to do). There are two answers to this very urgent problem. One is make sure you get those brakes with the two-finger shorty down-hill levers that reduce the risk of over applying them (which the Pacer does not have)—or to avoid them completely and get a E-bike with quality mechanically operated disc brakes or good old fashioned V-brakes that work so well. It is your life and health on the line—so make sure you have brakes that work for you—and practice emergency stops to avoid the fall. I have told so many makers about using the safe two-finger levers. Many have them, many have agreed I am right and made the shift to them. I do hope SmartMotion hears my plea for you and me, and make the change. Even if your bike comes with the full length levers, they can be changed for a cost that is fully worth it, compared to the pain the full length levers can cause you. I can still count on one hand how many times I almost went down as moving obstacles caught me off guard. Too much pressure caused wheel skidding and almost going over the bars. I am a decent long-time rider, still the danger reared it’s ugly head and I lucked my way through them. OK—rant over. So you know, not many makers are using the two-finger levers, so the Pacer is in the majority there. There is nothing like a BodyFloat to rise your bike spirits. Talking comfort on the Pacer is easy. It just naturally feels good. Shifting the 10 gears with the quality gear train is smooth and easy, partly due to the great hand shifter on the right side of the bars. Just the one gear ring up front makes things simple. Also being a BodyFloat isolation seat post dealer—this demo bike has one on-board, and it is like a bike dream that doesn’t stop. Both my wife’s and my E-bike have them. They are the best, better and simpler than full suspension bikes. Well there is so much more to tell about this cool and great performing E-bike from Lectric Cycles. I think you just need to hunt one down for you own test ride and evaluation. I didn’t mention the great display unit—you will love that too. Go E-bikes—Go Lectric Cycles! Turbo Bob. “Cycling is unique. No other sport lets you go like that—where there’s only the bike left to hold you up. If you ran as hard, you’d fall over. Your legs wouldn’t support you.”—Steve Johnson. Here are the videos of the SmartMotion Pacer I uploaded. Hidden Power E-bike Conversion—Light-weight Motivation. The whole Hidden Power kit comes in a fairly small and light box. Just over a month before the holidays I got this kit to test, ride and review. 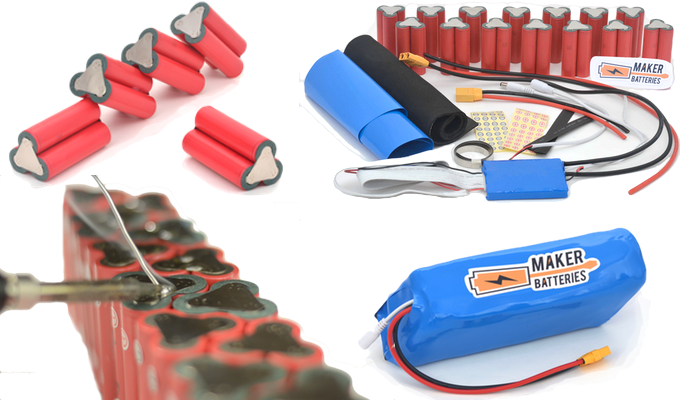 The Hidden Power kit has some great benefits and more than a few drawbacks too. I wanted to get this report out sooner, but I have been kind of aggressively following other interests and trying to keep warm and dry at the same time. Plenty of bike riding has been taking place and I will work to get back to my weekly posts on everything bike related. Thanks for staying connected while I was a bit off the grid. 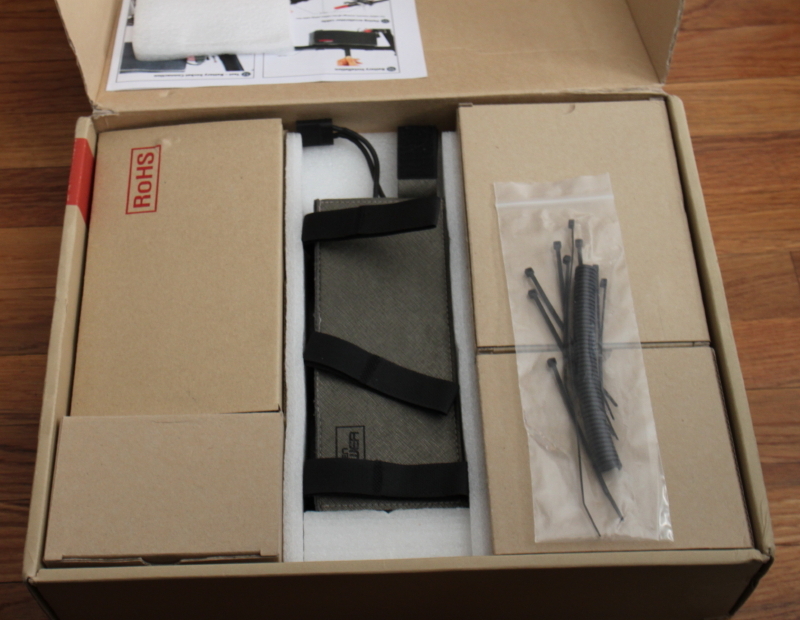 This kit has 5 variations, 4 for different folding bikes, and the one I chose, the standard kit. I expected it to fit on one of my hybrids, yet the distance from the seat tube to the tire was too great for the drive wheel to reach the tire. You may have already noticed two things, one is that this is a friction drive kit where the drive wheel of the kit turns the tire at the tread. Also, to use it, the bike must be rear fenderless or have the fender modified. So some time was used to see if it would fit any of my other or vintage bikes, no luck there. This is my new bike for doing more E-bike conversion tests. The Hidden Power kit is not all that noticeable. My new quest was to borrow or buy a suitable candidate bike, with the need considered of fitting the next E-bike conversion I already had in waiting. I was lucky to find a young couple with their first new baby that decided to sell their mostly unused bikes on Craigslist. I always worry about getting a bike this way, not wanting to feed the stolen bike market. So I safely got a great bike at a super deal and the test proceeded. The install was a breeze, yet a few small adjustments were needed. That was the swing of the unit to contact the tire correctly and when needed. I got it close, yet still felt I missed the narrow sweet spot. One thing that bothered me was on the box is the mention of the fact that the Hidden Power conversion kit won the Eurobike Gold Award in 2010. I am curious if the team has been working on upgrades and just how old the kit they sent me was. It all seemed new and unused in the past, so I am going on that assumption and what I could see and feel. I did have two issues with the way it worked (coming up), yet on the whole it got me where I was going with each ride. This is the motor and controller mounted and ready to ride. The other problem I had was being able to charge the battery, which uncovered one more deal too. I got the kit with the battery fully charged so riding quite a bit was no problem. When I went to recharge it, no luck there. It uses the same basic charger set-up as most E-bikes. I tried hooking it up many times, yet the lights on the charger would cycle through the colors and the voltage output fluctuated, but wouldn’t charge the battery. I decided to reach out to the supplier to see what they thought—or to get another battery and charger to complete my testing. You can see the whole kit (minus the throttle) from this angle. This was when I realized that customer service was slow or close to non-existence (at least in my part of the big world). Weeks later they contacted me to say that maybe they had supplied the wrong battery and for me to send some pictures. It has been over a month with again no response. I solved my charging problem myself so the test could resume. I used jumpers to charge the battery from the output wires instead of the normal charging inlet jack. That worked, so good deal there. 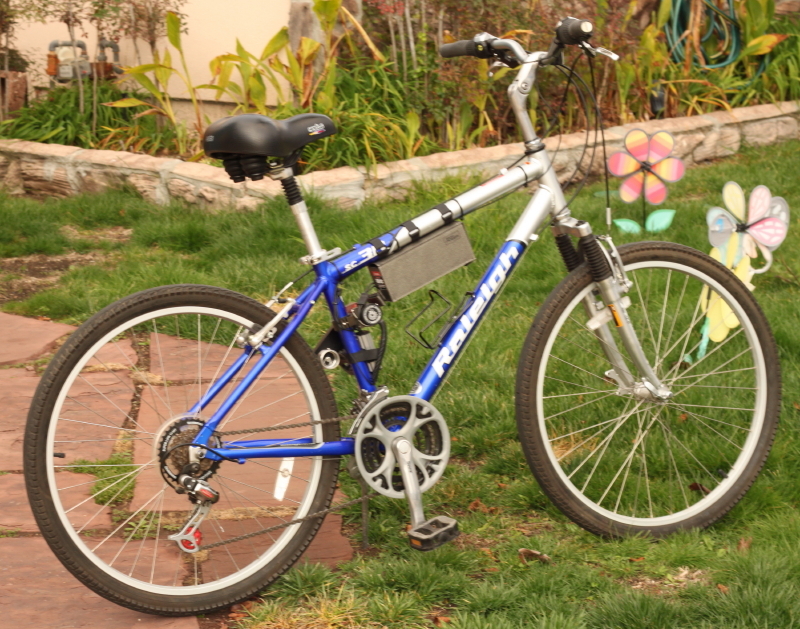 Being a 14 volt, 20 Ah battery, I had no other charger to use, plus a very strong rule with E-bikes is to use only the charger supplied by the bike of conversion kit maker. Before I talk about the ride, some more on the kit. 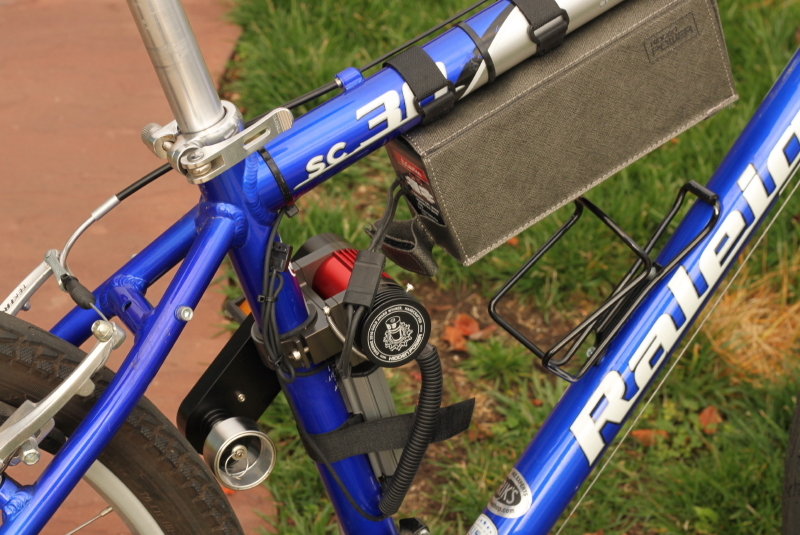 It came with a PAS unit for the pedals to activate the motor automatically when pedaling. With a short look I decided it wasn’t going to all line-up on this bike, so I decided to use the handlebar throttle only. This is a small unit that works like an old-school volume knob for a radio. Thing is it didn’t have different speeds, it works as an on-off switch only. This wasn’t really an issue as the motor is not that powerful. It took some time to get to full speed (about 18 mph I found). Love it or hate it—this is the throttle unit. Also, the throttle unit tie-strapped to the handgrip where it is a bit of in the way, so it was kind of uncomfortable with the ride and using the throttle. Not the best design, yet I became used to the action very quickly, so I decided it was ok. Like I said before the install was quick, with very few wires and things to deal with. One thing I thought needed an upgrade was the fact that the battery wires need to be disconnected when not in use. Most would add a main power switch for this purpose, not sure why the Hidden Power kit doesn’t have one. Riding was easy with enough assist for all but the medium and steep hills. I was surprised at the quiet noise level when it was powered up. It did make a bit of a clatter when it swung into engagement with the tire, yet not that bad. The drive wheel is very smooth aluminum, so that is why the motor was not a big noise maker, although when it’s wet outside I think some major slippage could occur. The last one like this I tested the wheel was sandpaper covered, which caused a lot of noise and tire wear. I am not sure which approach is really best. 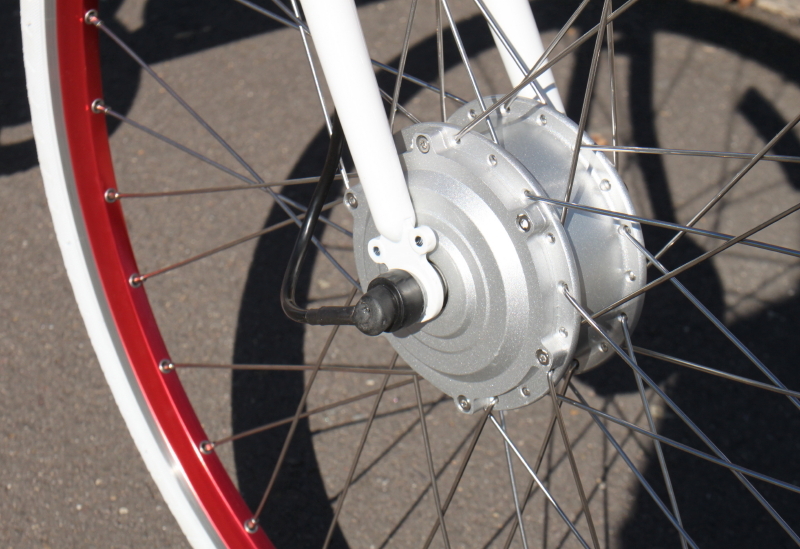 The deal is that friction drive is kind of outdated, yet basically works ok on low power E-bike kits. Here is the Hidden Power kit viewed from the other side of the bike. One thing I wasn’t able to check as good as I liked was the heat factor at the motor and drive. The last one I tested with this kind of arrangement made some excessive heat. The Hidden Power conversion uses less voltage and less power so the heat generated is probably acceptable. It is easy to check with the modern heat guns, so if you get one of these kits, keep an eye on that. Over 200 degrees F is not good. So on the whole it worked ok—not too fast or powerful. Yet with a 5 lbs, conversion that is to be expected. Customer service is questionable. This is something I rarely have problems with, as most the folks that supply me demo units are normally very interested in the progress of the testing. I do hope they reply when I ask them for a pre-paid return shipping label. It came from a USA source, yet is made in Korea. Hard to say if I recommend this conversion, but it was fun, easy and light. It is always your choice on what works best for you. Power your ride, Turbo Bob. “Bicycle means simplicity and simplicity means happiness”—Mehmet Murat ildan. Check out the videos I did for a better look and more info. 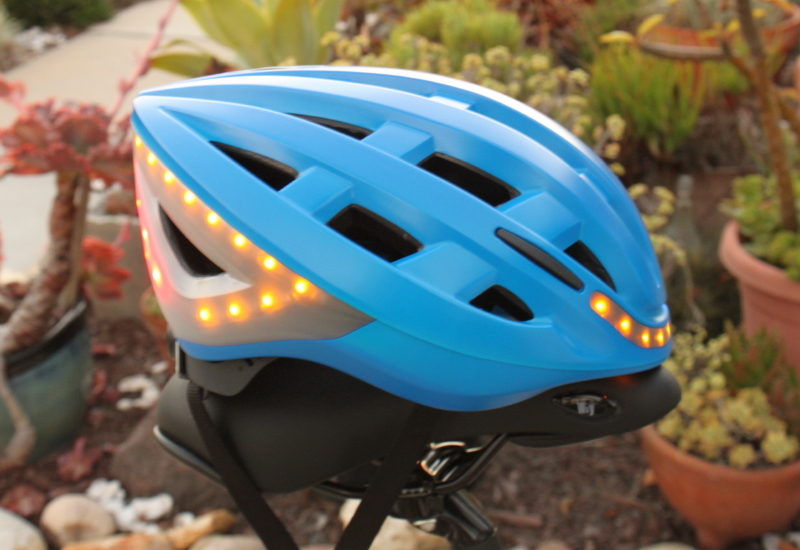 Lumos Lighted Bicycle Helmet—A New Step to Bike Happiness. As I unpacked the Lumos Helmet, this is what I found. 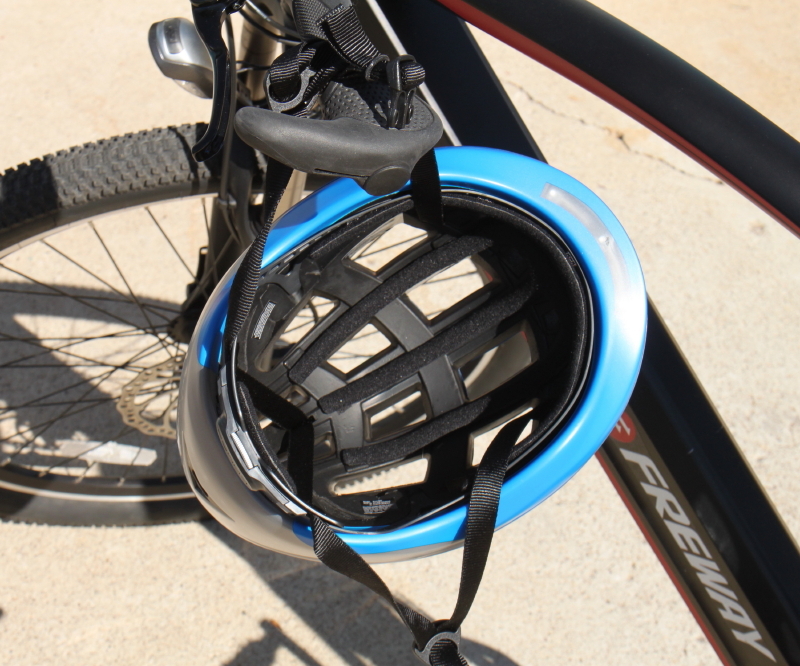 Another cool bike safety accessory has come to us through the crowdfunding world. 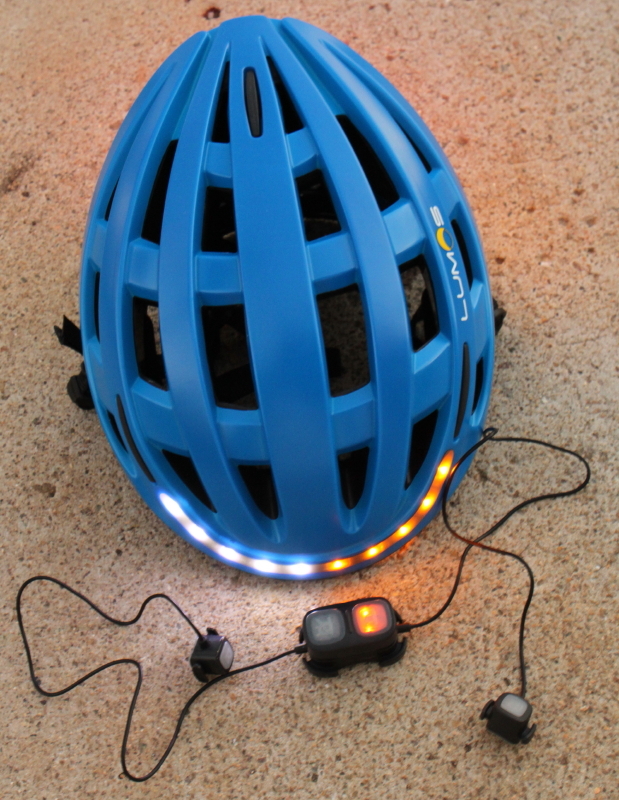 This time it is the Lumos Helmet, adorned with bright LED lights and more. It meets all the modern requirements for helmets, but has some interesting features you may be looking for. It has the sleek road bike look that talks speed and even comes in 3 different colors. More sizes are in the works, yet for now just one adult size is in the catalog. So beyond the fact that it is a bicycle helmet there is much more to see. It has 50 super bright LED lights that can blink or stay on steady. They are nicely molded into the helmet for a smooth contour and even though you can’t submerge it in water (although you probably could) it is weatherproof enough for most any conditions you will find during your ride. The lithium battery and LED lights should last for many years, so this is one bike product that will stand the test of time. You can use the main handlebar unit, or the one with buttons near each handgrip. Other than just blinking lights (actually 3 modes—solid on—slow blink—fast blink), it has turn signals and a braking light you can actuate. 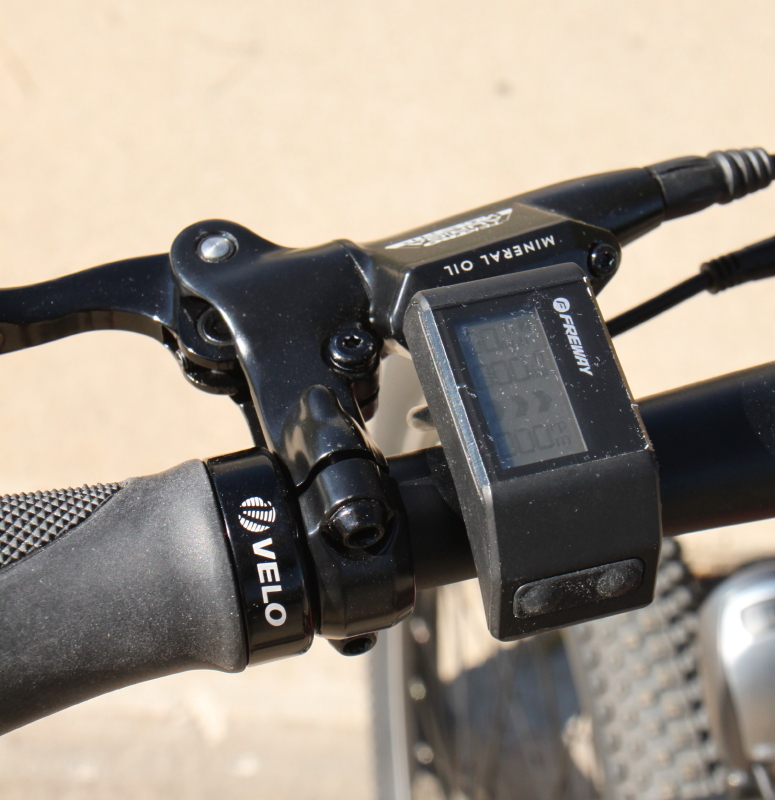 The turn signals are run with a small handlebar mounted remote switch device. Two different choices are included with the helmet, one is a dual button that has both left and right buttons together. The other has short wires so you can have one button by each handgrip. The individual buttons setup still uses the all in one unit, and that is the one that blinks when the turn signal are on. This may seem confusing so check the video I shared below. When the turn signals are on, half of the front lights (normally white) start blinking in yellow. And the side rear lights (normally off) blink in yellow too. In addition to that, there is a light just above your eyes that blinks too, so maybe you will notice they are on, prompting you to turn them back off when your turn is completed. There is a beep when the signals are turned on or off, yet it is quiet while the turn lights are blinking. That same beep can be heard when the main lights are turned on and off. Turn lights a blinking—easy to see by everyone near by. In the back of the helmet is the main power switch. Next to it is an Apple like charge receptacle. The remote turn switch for the bars has the same port. 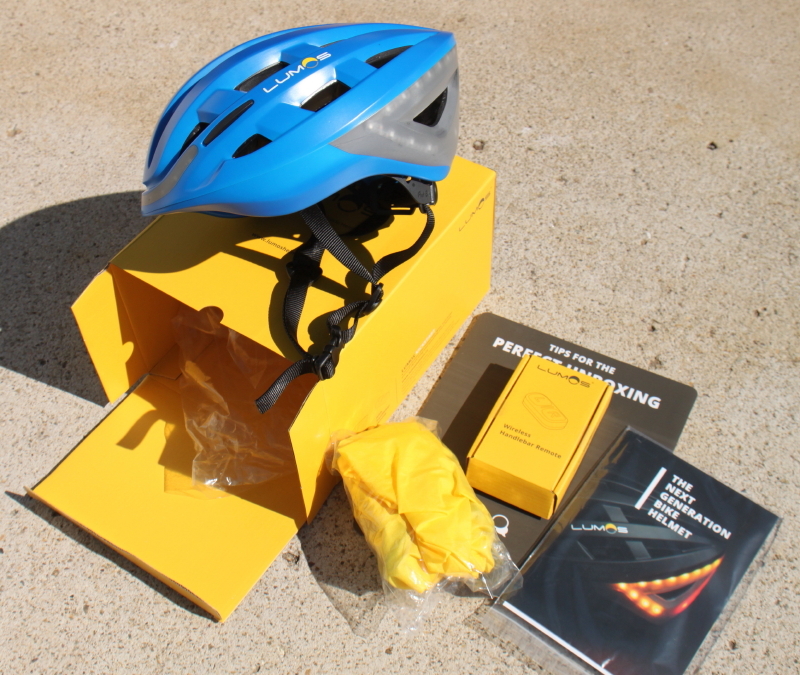 The helmet even comes with two charge cords (USB) so charging each is quick and easy. Lumos claims about 2 hours to charge (less if the battery isn’t fully flat) and run times of about 3 hours on solid and 6 on blinking mode. This is pretty much what I found in use, so their numbers match well with the real life experience. For most commuters, this relates to charging it once or twice a week. The Lumos has a brake light mode, yet this skid lid comes with that feature disabled. They are still working the details, and when perfected if can be uploaded to the unit in the field. It is easy to enable the mode, should work fairly well, but will affect the run times heavily. As for now, I have left mine in the off mode until a time it works with nary a hitch. Inside it has the basic foam inserts and band tightening knob. Being a one-size fits all helmet for now, you may be a bit too big or small for it. It has the foam inserts that can be changed for thicker ones, yet no extras were in the box. It also has the big knob in the back strapping to help adjust it to your head. For me, the fit is just fine and comfortable. They do claim on their site that soon they will be offering different sizes, so if you are concerned that a standard adult size isn’t for you, just hold on and your wishes should be filled soon. I found it just a tad on the heavy side (pretty close to one pound). For most this will be fine, yet the extreme roadies and people who ride with their backs parallel to the ground, it might add some neck strain. All in all, I like the Lumos helmet. Truth for me is I rarely wear one, so the testing put me a bit out of my normal box. And as long as I am putting my personal thoughts forward, the turn signal thing doesn’t get me all that excited. The chance of folks around you seeing and interpreting the blinking turn signal light seem on the basically slim side to me. When I was a kid they had gimmicky t/s lights for the back of bikes (in fact they still sell them). Cool I guess, yet not my thing. My arms, body and eyes seem to do what I need to get the people around me attention’s for turns and the such. With a sleek look, the Lumos Helmet has much to offer in comfort and safety. What I do really like are the super bright blinking lights in general. Anything you can do to catch the attention of the people that can do you harm is very important. 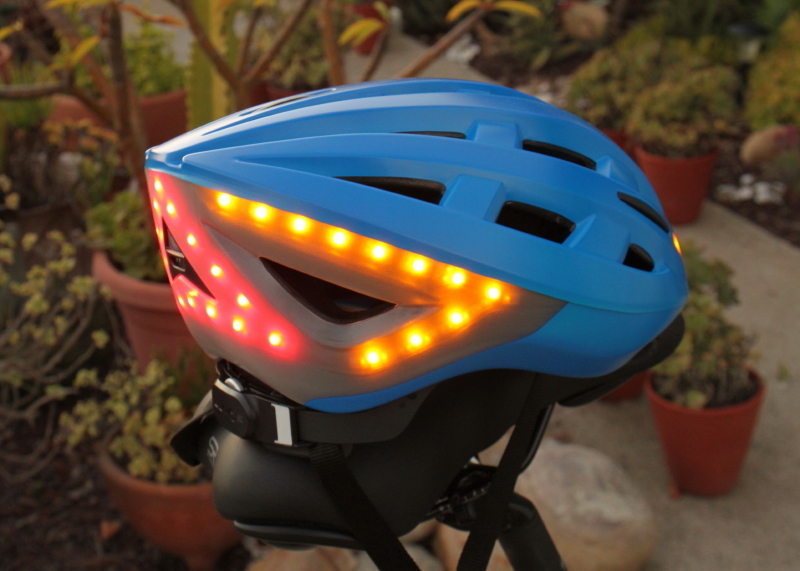 I am all for lots of blinking lights, day or night on everyone’s bikes, so more bright ones on your brain bucket are gold. These lights are very bright. They might not be too noticeable on the sunniest of days, yet in most conditions they will be standing out strong. Now remember, Jose Jimenez (Bill Dana) hopes you won’t call this a crash helmet, something I hope too. Yet it is nice to know that your bike protection gear serves more than one purpose. It should do a lot to keep you on two wheels, yet if the worse happens, it will be there to back you up you too. 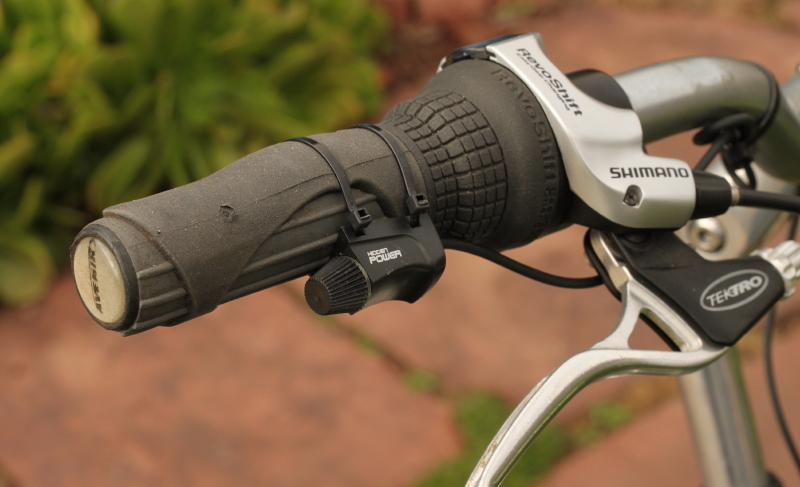 80 lumens of light high above the traffic should make you easy to see anytime you mount up on your bike. And that should make riding much more pleasurable. Go Lumos and go safe, Turbo Bob. “A few years ago, I bought a old red bicycle with the words Free Spirit written across the side—which is exactly what I felt when I rode it down the street in a tie-dyed dress.”—Drew Barrymore. You can find Lumos on their website or Facebook page. Here are a couple videos I shot with the Lumos Helmet. 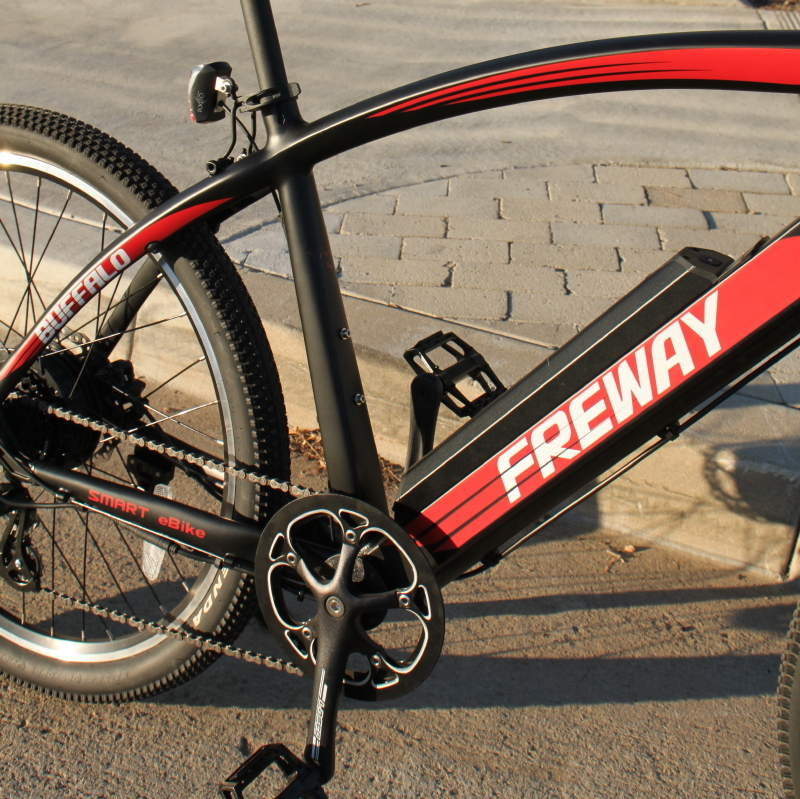 Buffalo Electric Bike by Freway—Singletrack Sweetheart. Looking sharp and riding good—the Freway Buffalo. It’s been close to a year since I reviewed the Freway VR-01, and even at that time there was talk of this upgraded offering. It was a long wait, yet well worth the months that passed. Electric mountain bikes aren’t number one on my list of favorites (maybe yours though), but I did have some big fun on this Buffalo. With a distance glance they might seem much the same, yet let’s see what makes this bike better and nicer than the VR-01. I guess the biggest factor here is more power. 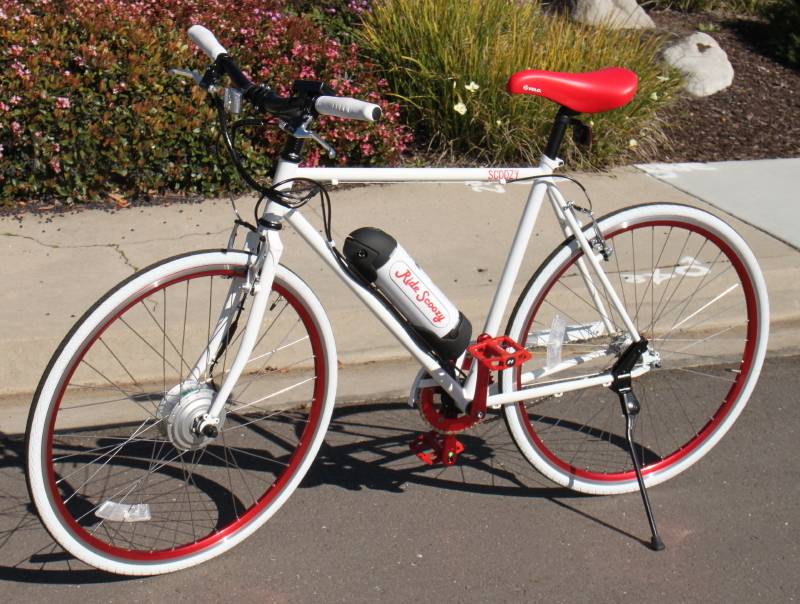 With a 36 volt 350 watt motor, it climbs and rides with much better authority. This is a great feature as more grunt and speed was one of the things I desired in their other model. It also has more battery capacity so longer rides are in the works at any given time. Sliding the lithium battery into the curvature of the frame makes for a sleeker look too. They also added a USB output that many will just love to have. The battery is tucked nicely onto the aluminum frame. Although the control system stays much the same, the control buttons and display are completely different. With no hand throttle to add power, all your assist comes when your pedaling triggers the motor into action. Three levels of power assist (and an off setting) allow you enough choices for most any kind of ride. I am a big fan of having a throttle, yet the lack of one makes this a class 1 E-bike with less restrictions on riding locations (in California at least). Plus, many like a true pedelec as they give a more authentic bike riding experience for the people that expect it that way. The display is a mini unit on the left side of the bars with two buttons that control all the features. This might seem like a downgrade, yet for the bike’s purpose I think it works well. With the rough and tumble life of a mountain bike, the display is well protected. Plus not having that big display front and center, it leaves more room on the bars for lights and other accessories. The bike comes with a nice lighting system (front and rear) that runs off the motor battery, but when you are really pushing it, you will need some serious accessory lighting at night. 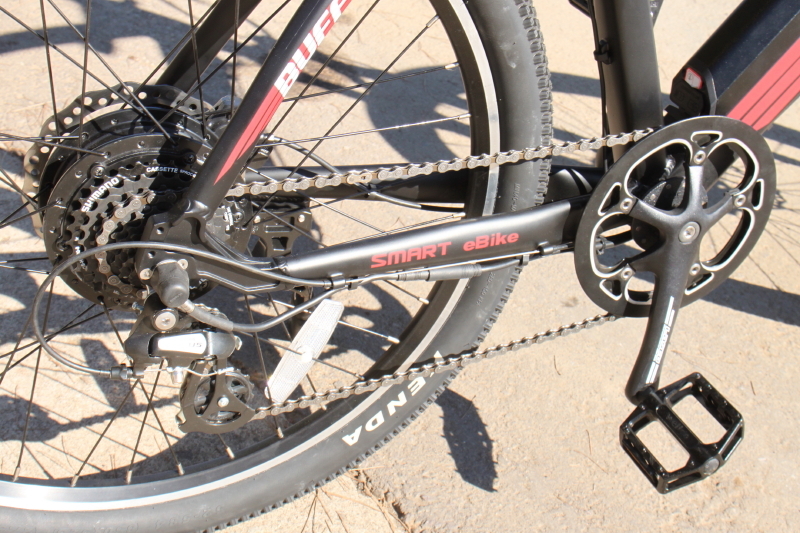 The Buffalo moves to a 1 X 8 drivetrain as opposed to the VR-01’s 3 X 7. I like this change (8 gears instead of 27) and having a single front chainring makes big sense to me. For the serious climbers the missing extra low gears might be an issue, but the motor has more pull, so it felt like a even trade off to me. The shifting is quick and simple with a well placed thumb shifter. There is very little delay with the application of motor power, so all the dirt banging around I did felt great. Before we talk more about this bike, I want to cover the company some. They have been around a couple years and seem to have two bikes in their line-up at the moment. I saw a catalog of future bikes and they have some beauties coming out soon. I understand their main US facility is in the Los Angeles area, although they might have more than one. This Buffalo should be shipping any day now (30 days and it seems it will be a Kickstarter?). They have a couple retail locations, but for the time being most all transactions with them will be online. I do hope to see more places where Freway E-bikes can be test ridden and purchased, as choosing a bike in person is a desirable way to move forward. Headed for Kickstarter very soon. I enjoyed my time on the Buffalo. I am lucky to be fairly close to their offices, so getting a chance to ride and test the Buffalo was a breeze. I made sure to put it through it’s paces quite a bit during this week so I can relay the results here for you. I enjoyed the VR-01, yet this bike just has so much more to get you down the road. It is still a generally inexpensive E-bike in the scheme of things, so expecting too much wouldn’t be wise, yet it did everything I asked of it every time I mounted up for a brisk and fun experience. The fit and finish is impressive too. Hydraulic disc brakes are becoming the norm nowadays and this Buffalo is no different. They work strong and were easy to modulate on the low traction surfaces I rode. I continually am pushing towards 2 finger levers for these types of brakes, the Buffalo has the smaller ones, yet more like 3 finger. If you pull too hard on the levers of hydraulic brakes you risk an incident, so the shorter levers are key to bike safety. The ones on this bike are on my approval list. Up front is a ok working front suspension fork, yet like the ones on most E-bikes, it doesn’t stand out as exceptional in the real rough stuff. Built-in front and rear lighting are always nice to see on an E-bike. 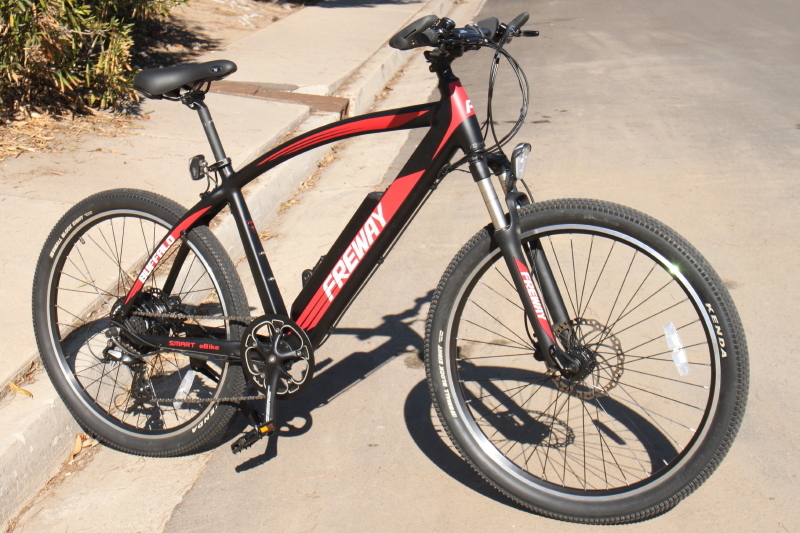 Even though the Freway Buffalo is a mountain E-bike, that doesn’t mean you can’t ride it anywhere and anytime. The Kenda tires are just a touch or two more aggressive than street tires, yet not the all out backwoods type on the real racers. The rims, gears, frame and brakes all seem beefy enough to do dual duty, so when I had it on the trails I felt confidence that I was going to have some solid riding with no twisted body or bike parts. I didn’t ride the battery to the end of the charge even once, yet I could tell it has a long range you would expect from a 11 Ah battery on a 350 watt bike. Freway has put together a nice package here. Looks wise I have no complaints, and once in the saddle I got the same feeling. Unlike most mountain E-bikes, it has a big kickstand that will help it keep looking good for a long time, and help it from getting all beat up when you are parked (I see people fling their bikes to the ground all the time—not good for any part of the bike). The lights work nice and the rear one even blinks (my preference, although most I’ve tested don’t). The power was more than enough for all but those giant San Francisco type hills. For street riding I would swap out the saddle (normal 1st up-grade), yet for the most part this Buffalo has what you need to ride. Singletrack or street, I kept smiling as long as the wheels kept turning, Turbo Bob. “Bicycling is the nearest approximation I know to the flight of birds.”—Louis J. Helle. You can find Freway on Facebook and their website. I shot these two videos during my time with the Buffalo.